In a moment of Washington gridlock of the sort we’ve had since the 2010 midterms (and arguably before that in the filibuster-bound Senate), it’s easy to fall into the trap of thinking that truly nothing has been getting done, and perhaps even that there won’t be all that much of a difference if the other guys win the White House this fall, as long as Democrats still can filibuster bills in the Senate. But a terrific report by Eric Lipton in Wednesday’s New York Times offered yet another reminder of why this is very much not the case. “The math screams at you to do gas,” said Mr. Morris, whose company is the nation’s largest consumer of coal. Environmental groups, after years of targeting coal plants as leading sources of air pollution, have moved in for the kill. 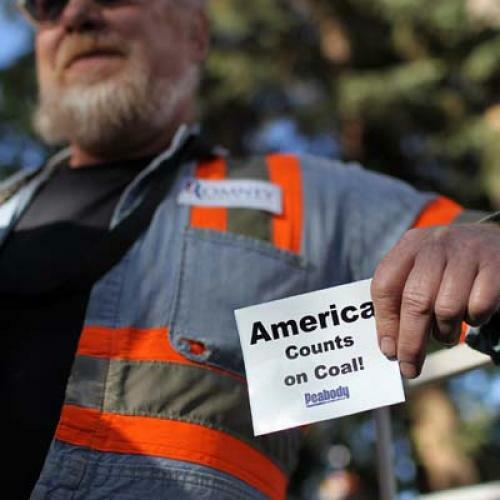 “We never thought we would get to a place where coal plants are falling so fast,” said Bruce Nilles, the director of the Sierra Club’s Beyond Coal initiative. Coal should not be written off just yet, notes Lipton—it’s still providing a third of our energy and it has major lobbying oomph in state capitals and Washington. What Lipton only briefly touches on, though, is how much the future course of this shift will be influenced by the election. Republicans receive the vast majority of coal industry money and Mitt Romney only just the other day was singing the praises of coal during a visit to Colorado (never mind that Colorado has a growing clean-energy industry and that Romney himself pushed anti-coal policies as governor of Massachusetts, at least before he decided to run for president). King Coal truly has as much riding on Mitt Romney’s candidacy as any sector out there. And yes, Barack Obama probably will be doing even worse in eastern Kentucky than he did in 2008 (as my favorite map offers stark proof of). Many voters in that impoverished swath of Appalachia will be getting health coverage as a result of Obamacare, assuming the Supreme Court lets them. But they’ll be hearing a lot more about the War on Coal. He won’t need the Kentuckians in the Electoral College, of course, but he’ll need at least a few of their brethren in western Virginia and southeastern Ohio. Obama may have fallen short on cap and trade, but the plight of coal, at some political risk for Obama, argues for a more nuanced assessment of his work on this front. *Update: Lipton is now reporting that American Electric Power is withdrawing its request for a utility rate hike in Kentucky to pay for the retrofit needed to keep open the above-referenced plant in the heart of coal country, Big Sandy. The march from coal continues.